Summary: Tacrolimus is an immunosuppressive agent that can show a wide variety of neurologic side effects, including leukoencephalopathy. Although the prognosis is good—after cessation or dose reduction, complete recovery usually occurs—the differentiation with treatable diseases such as progressive multifocal encephalopathy can be difficult, making a stereotactic biopsy of the white matter lesion sometimes necessary. We describe the case of a 12-year-old girl with a severe, reversible tacrolimus-related leukoencephalopathy and only mild histopathologic abnormalities. Tacrolimus (FK-506) is an immunosuppressive agent frequently used after organ transplantation. A wide variety of neurologic side effects has been described, resembling those in cyclosporine therapy (1). Although they are reported to be minor (headache, tremor, paresthesia) in most organ transplant patients, major neurotoxicity, such as leukoencephalopathy, develops in 1–6% of transplant recipients (2). So far, the etiology is unknown. There is no absolute relationship between the serum tacrolimus level and the occurrence or severity of neurologic symptoms, but high levels are often found with neurologic improvement on dose reduction (2). Neurologic symptoms and signs are usually manifested soon after transplantation. In 82% of the affected patients with leukoencephalopathy, this complication is reported to occur within 3 months after transplantation and even earlier in liver transplant recipients (2). MR imaging may reveal white matter lesions predominantly in the posterior cerebral regions (3). To our knowledge, there is only one previous report with histopathologic analysis of tacrolimus leukoencephalopathy: the white matter was described to show small areas of demyelination, which were associated with veins and with sparing of axons in these areas (4). Other causes of white matter lesions, especially opportunistic infections such as progressive multifocal leukoencephalopathy (PML) can be difficult to exclude, and in some cases a biopsy of the lesion is indicated. We present a case of extensive leukoencephalopathy as a relatively late complication of tacrolimus therapy in which serum drug levels were normal and no concomitant disease existed. The severe clinical and radiologic presentation contrasts with the mild histopathologic findings. A 12-year-old girl underwent an orthotopic liver transplantation in March 1999 and received tacrolimus 3 mg daily and prednisolon 15 mg daily. For 6 weeks after transplantation, she was hypertensive. Thereafter she remained normotensive with medication. Six months after transplantation, she had a focal, secondary generalizing seizure. Within 2 minutes, the seizure stopped. Blood pressure was normal. Neurologic examination revealed a left-sided hemiplegia including an extensor plantar response and a tremor of both hands. Laboratory findings, including liver and renal function, cholesterol, magnesium, and CSF were normal. Polymerase chain reaction analysis for JC virus in the CSF was negative. Tacrolimus blood level was within therapeutic range; 14.9 ng/mL (normal values 5–20 ng/mL). On the cerebral CT scan, the subcortical white matter was hypoattenuated (Fig 1A). 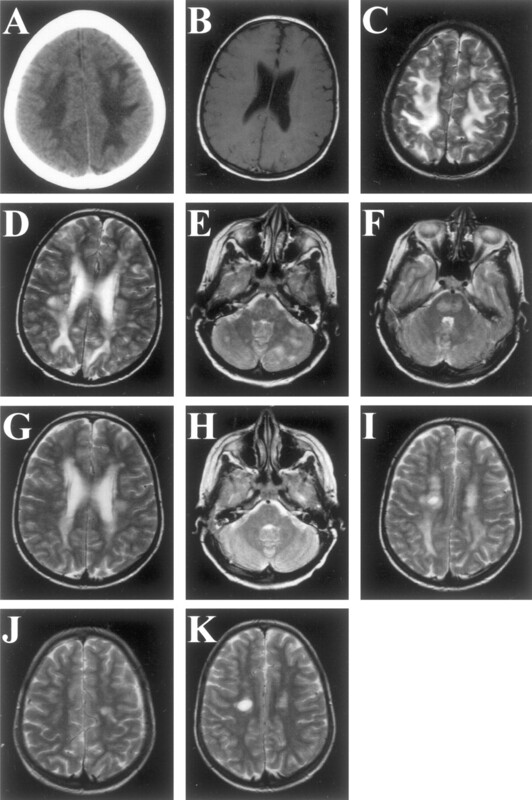 MR imaging 1 day after presentation showed extensive white matter lesions on T2-weighted images, without gadolinium enhancement or decreased signal intensity on T1-weighted images (Fig 1B–F). Because of the late occurrence, the lesion extent, and the possibility that a treatable disorder such as PML might be overlooked, a stereotactic biopsy was performed after 2 weeks. After microscopic examination of the biopsy that did not show features of infection, diagnosis of tacrolimus-induced leukoencephalopathy was made (Fig 2A and B). After a decrease in tacrolimus dosage, the white matter lesions gradually disappeared (Fig 1G–H). Clinical recovery was complete within 5 months. At that time, MR imaging showed only mild cerebral white matter lesions (Fig 1J and K). During 3 years of follow-up, she has had no neurologic sequelae and has retained normal liver function. Radiographic findings in a 12-year-old girl with a severe, reversible tacrolimus-related leukoencephalopathy. A, Cerebral CT scan shows extensive subcortical hypoattenuation in both parietal regions (canthus-meatus plane, without contrast). B, T1-weighted MR image obtained in the acute phase (day 1) shows no gadolinium enhancement or decreased signal intensity (5 mm slices, TR 760, TE 15/1, TA 03:42). C–F, T2-weighted MR images obtained in the acute phase (day 1) show hyperintense lesions in the parietal white matter (C), periventricular white matter (D), cerebellum (E), and brainstem (F) (5 mm slices, TR 3100, TE 98/2, TA 04:03). G–I, T2-weighted MR images obtained 18 days later (day 19), after a dose reduction of tacrolimus and stereotactic biopsy 6 days earlier, show a remarkable decrease in the hyperintense lesions in the parietal white matter (G). The hyperintense lesions in the cerebellar white matter and brain stem (H) have disappeared. Note the biopsy lesion (I) (5 mm slices, TR 3100, TE 98/2, TA 04:03). J and K, T2-weighted MR images obtained 5 months after G–I show only a mild right-sided hyperintense lesion (J). In the left hemisphere, the biopsy lesion resides (K) (5 mm slices, TR 3100, TE 98/2, TA 04:03). 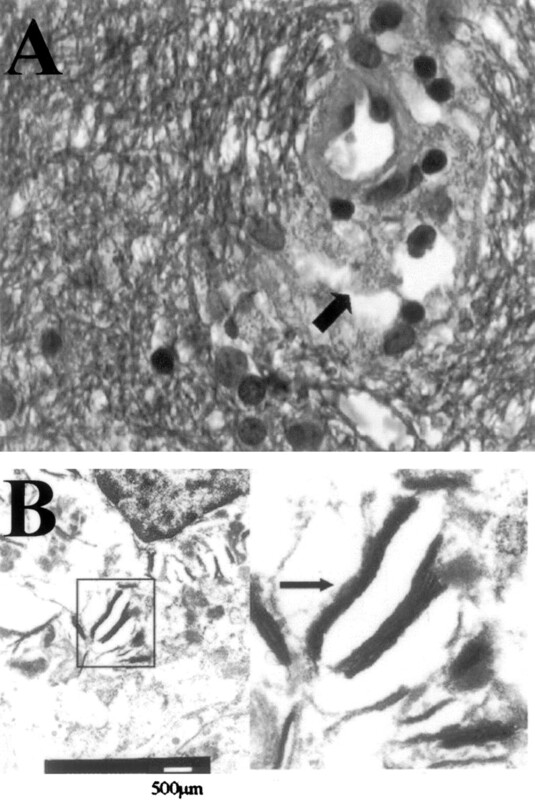 A, In the biopsy fragments, the cerebral white matter shows a normal aspect with ample staining for myelin, absence of inflammatory infiltrate and (in contrast to PML) absence of enlarged nuclei of glial cells. Occasional perivascular macrophages (arrow), however, contain granular, blue-staining material, consistent with myelin debris. (Combined Luxol Fast Blue and Hematoxylin-Eosin staining; original magnification ×630). B, Electron microscopy, performed on material retrieved from the paraffin block, reveals multilamellar particles in the perivascular macrophages, corroborating the myelin nature of these granules. Leukoencephalopathy is a complication of tacrolimus use in both adults and children and is usually reversible after dose reduction of tacrolimus in almost all patients when diagnosed promptly (5). The pathophysiologic basis for tacrolimus neurotoxicity is unknown. Factors that are reported to facilitate neurotoxicity are systemic hypertension, high-dose corticosteroid therapy, serum hypocholesterolemia, hypomagnesemia, aluminum overload, and hepatic encephalopathy (2). In our patient, high-dose corticosteroid therapy might have contributed to the leukoencephalopathy, whereas the contribution of hypertension seems less likely, because it was successfully treated. Tacrolimus is a lipophilic agent that crosses the blood-brain barrier and, like cyclosporine, may have a direct neurotoxic effect, especially on the lipid-rich white matter (6). Furthermore, cyclosporine is known to cause axonal swelling, but this effect has not yet been described for tacrolimus use (5). Our patient had one focal, secondary generalizing seizure lasting less than 2 minutes. This was the single epileptic event. Seizures may lead to transient MR signal intensity changes themselves (7, 8). Because of the lack of MR imaging findings of involvement of cortical structures, the extent of the lesions, and the absence of a prolonged epileptic event, we find that the convulsion cannot be responsible for the white matter lesions. In most patients with tacrolimus-related leukoencephalopathy, a biopsy procedure is not considered to be necessary when after cessation or dose reduction of tacrolimus the clinical condition improves. In our patient, however, the lesions were very extensive and occurred relatively late after transplantation. Therefore other diseases, especially PML, had to be considered. In the only previous histopathologic report of tacrolimus leukoencephalopathy, focal, predominantly perivenous demyelination was found (4). In our patient, stereotactic biopsy findings of cerebral white matter showed, by light microscopy, a normal structure and staining for myelin (Fig 2A), but occasional perivascular macrophages containing lamellar bodies consistent with myelin debris were present (Fig 2A and B). We conclude that leukoencephalopathy is a serious complication of tacrolimus use that can be completely reversible after dose decrement. Although at the radiologic level a predilection for the posterior cerebral white matter has been reported, the lesions may be much more extensive. The relatively mild histologic findings and the reversibility of the clinical syndrome indicate that these impressive radiologic changes are, at least in an early phase, in large part the result of reversible edema instead of destructive structural alterations. Accepted after revision April 6, 2002.